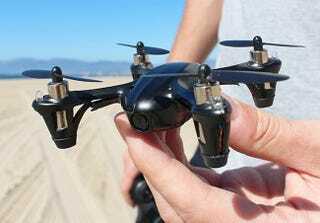 A few weeks ago, we offered a pre order discount on this limited edition Code Black Drone to Gizmodo readers. It sold out in 2 days. So, after securing more units, we've brought it back for Lifehacker readers, who can get a pre-order discount of 55% off a Code Black Drone + Free Shipping. The Code Black has an HD camera and a six-axis control system. There are also four different mid-air flips in the Code Black's repertoire. And then there's the price of $89 — with the current pre-order discount applied. Once the pre-order ends, the price will be going up. Note – units will ship in early December, so they'll arrive with plenty of time before Christmas. Drone flying not your thing? Also through StackSocial, Lifehacker readers can get 1 year of SpiderOak cloud storage for 58% off ($99). SpiderOak was made famous by Edward Snowden, who encourages using it over Dropbox, as it's much more secure. For $99 you get 1 year of 200 GB cloud storage.